As long as there have been trees growing in the forest, there has been mulch on the ground beneath the trees. Cultivated gardens benefit from mulch as much as natural forests, and chipped wood makes an excellent mulch. Find out about the many benefits of wood mulch in this article. 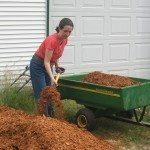 Are Wood Chips Good Mulch? Using wood mulch benefits the environment because waste wood goes into the garden instead of a landfill. Wood mulch is economical, readily available, and it’s easy to apply and remove. It isn’t blown around by winds like lightweight mulches. When it no longer looks its best, you can compost it or work it directly into the soil. Moisture retention – Covering the soil with 2 inches of wood mulch slows moisture evaporation from the soil. Temperature moderation – Wood chips block the sun and help keep the soil cool. Weed control – Weeds have difficulty emerging from beneath a cover of wood chips. Wood chips contain wood and bark bits in a wide range of sizes. The diversity of size benefits the soil by allowing water to infiltrate and preventing compaction. It also decomposes at different rates, creating a diverse environment for soil organisms. 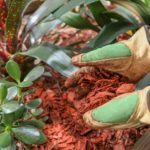 Wood bark is another type of mulch that performs well in the garden. Cedar, pine, spruce and hemlock are different types of bark mulch that vary in color and appearance. They all make effective mulches, and it’s fine to choose based on aesthetics. Another factor to consider is the longevity of the mulch. Pine will break down quickly while cedar may take years. You can use either chipped wood or bark mulch with confidence, knowing that you are helping your garden and the environment. There are, however, a few precautions you should take. Keep wood mulch away from the trunks of trees to prevent rot. If you are concerned about termites, use cedar mulch or keep other wood mulches at least 6 inches from the foundation. Let your mulch age if you aren’t sure of your source. This allows time for any sprays that were used on the tree or diseases it may have had to break down.